Every publisher sells using a single-page sales sheet (“AI” or "Advance Information sheet" in the UK, and “tipsheet” in the USA), which they present to their trade customers. The buyer takes a decision on how prominent to make it on their databases, whether to take print copies into stock, and if so, how many and where. It is our chance to grab their attention, and the information must be accurate, punchy and concise. The AI/Tipsheet is circulated to our sales reps, specific to their territories, and they will use the information on it as the basis of their pitch. Some reps may modify the format of the sheet we provide, but all the information stems from your Book Details page on the database. Please see Chapter 16 Sales and Ordering: Introduction to Selling Your Book, for full information about our sales representation. Sales reps can use the AI/Tipsheet either in physical printed format or electronically. What the bookshop buyer is looking for, at a quick glance, is why this book is relevant to them. It must have clear copy, strong endorsements from people they have heard of, or that their customers are likely to know. Unique Selling Points which suggest that there are good reasons why they should stock this book and not another; Marketing Plans that are going to bring people into the shop asking for it; Competing Books so they know what the book is about. A general feeling that the author understands who they are writing the book for and where it fits into the market. Book Description: Booksellers have very little time to consider each title pitched to them, so make sure the language used in your book's Description is succinct and accessible. Please consider this especially carefully if your book is more academic or niche in subject matter. Your location: This is required for the copy in your Author Bio, and will be used by the sales teams when selling to chain and independent bookshops, for whom local authors are often a selling point. Previous titles: If we're publishing your exciting debut title then we'll sell it as that, but if you've had previous publishing success then the sales teams want to hear about it. Marketing plans: As early as possible please record any arrangements you have made for a book launch (particularly date and location) as well as making note of any magazines/journals/newspapers/blog sites which have agreed to place an article by you, or to interview you. You might have not known this information when you submitted your proposal to us, but since signing your book contract you may have begun working on these arrangements, and the more specific you can be in your Marketing plan the better. Endorsements: You may not have aquired these until after signing your book contract, so please add them as early as possible to your Book Details page under Endorsements, sorting them by order of importance. Unique Selling Points: It's no secret that the fight for space on bookshelves in shops is highly competitive. Tell booksellers why your book is one they should order, and why their customers will want to buy it. Competing Books: You know best which titles your book can be most accurately compared to, be it either by style, content or audience. Please add these under Competing Books on your Book Details page, confining your choices to books published in the previous three years that sold well. The sales teams will use these when pitching your book to trade buyers, so do make sure to be realistic about your competing books; buyers will have lost count of the number of times they've been pitched, for example, 'the next Harry Potter'. Categories: Again, you know your book and its content, so take some time looking through and assigning Categories at the bottom of your Book Details page. We will check these and make any adjustments we feel necessary but, particularly if your book is more academic or niche in subject matter, then your judgement is of great importance. Once we've edited the above information in the month after your book's publication date is set, we then create and upload the AI to your Marketing page and you can not alter it. Therefore, providing this information by the time your book has been assigned a publication date will ensure your AI is as strong as possible. Feel free to download and use it. Take it along to local stores who might host a signing session if the publicist has not already contacted them. The Email History section here holds the newsletters that we send out. Click on the blue link to see the text. Four of these Trade Newsletters each month go to contacts in the categories: MBS, Religion, Academic and General, who have subscribed to receive them. Fiction and non-fiction titles not in MBS, Religion or Academic categories are featured prominently in the General Newsletter. This goes mainly to non-specialist bookstores and foreign publishers. With their agreement you too can subscribe any booksellers, bloggers or journalists you know by ticking the box yourself at the bottom of the Contact's page, or asking them to subscribe on our website in "Contact Us." 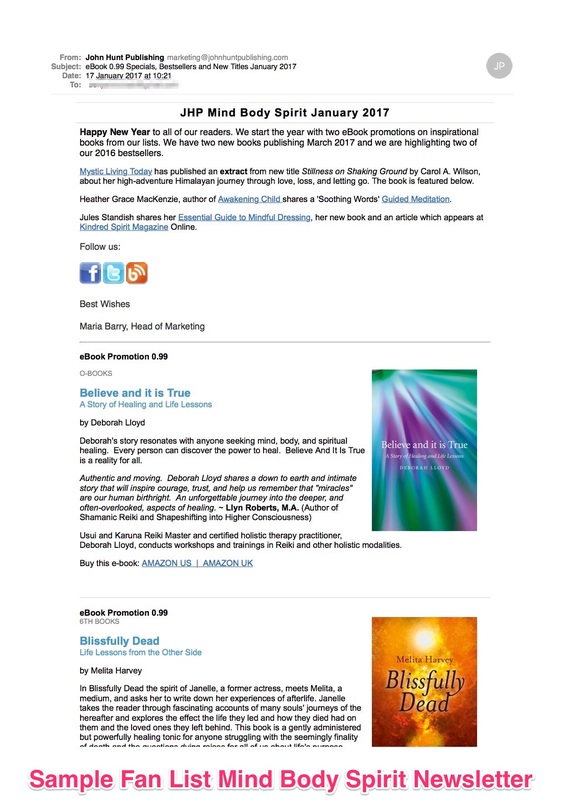 The newsletter consists of new titles, bestsellers and notable backlist. Subscribers can click through from the newsletter to request review copies, both printed and digital. We have started to build up a keen fan base of readers who have "joined our mailing list" though our websites. We send them four Readers Newsletters monthly, same categories as Trade. These newsletters are supplemented by occasional seasonal or topical news on groups of titles, newsworthy items, promotions on individual titles. These are sent to trade, media, readers and even authors.